ConnectedText (CT) – a personal (or desktop) wiki, database for notes (i.e. Zettelkasten), outliner, writing tool, diary application, and whatever else you make of it. It has not been marketed as a dedicated CAQDAS tool (such as Atlas.ti or NVivo), however being the flexible tool that it is I have used it as my main CAQDAS solution (I was an NVivo user before). To run CT on a Mac or iPad see this, for Linux, see this. WorkFlowy [FREEMIUM] – for quick and short notes (especially to-dos) on the PC, iOS devices, and Chromebook. Caret and Writebox [FREE] – for taking textual notes on the Chromebook. Boogie Board Sync 9.7 eWriter – for taking handwritten notes, syncing them with PC via bluetooth, converting them to PNG image files, and dragging and dropping them into ConnectedText for archiving. Surfulater – for capturing, storing and organising web page content on the PC (I prefer to keep web content separate from my other notes). ABBYY Screenshot Reader [used to be FREE; it may also come as bonus with FineReader Pro] – for extracting text from screenshots (or scanned PDFs) using OCR (though it has some other capture features as well). Screenshot Captor [FREE/DONATIONWARE] – sophisticated but easy-to-use screenshot tool with editor for annotations. NoteTab Light [FREE] – my Notepad replacement. ClipCache Pro – a clipboard extender. I have it running constantly in the background as a kind of a note-taking back-up service, should I need to find something that I had copied at some point and then lost somehow. Olympus Digital Voice Recorder WS-331M with Olympus RS28 foot control (for transcription) – these models are probably very out of date, however they’ve served me well and are still functioning perfectly after many years. I use Olympus DSS Player Plus 7 transcription software and felt no need to upgrade. HP Chromebook 14 and Asus Chromebook Flip – my laptops for note-taking and surfing (and general iPad replacement). PDF-XChange Viewer PRO [there is also a FREE version] – for reading and annotating PDFs on the PC. Recently changed to PDF-XChange Editor. ABBYY FineReader 11 Pro – for converting PDF articles into Word, so quotes can be imported via direct copy and paste (i.e. without the NoteTab process described above) into CT.
A-PDF Comment Collector – a nifty little tool for extracting pages with comments from a large number of PDF files and collecting them in a single PDF document, with links back to the original PDF files. Boogie Board Sync 9.7 eWriter – for handwritten notes and diagrams to be synced with PC (and dropped into CT). WorkFlowy [FREEMIUM] – online outliner with iOS and ChromeOS apps and a cross-platform Chrome app. Noteliner [FREE] – a very easy-to-use outliner for quick outlining jobs. Natara Bonsai 5 Desktop Edition – a (one-, two-, or three-pane) outliner, for when the list gets more complex and needs more careful analysis and sorting. “Colouring in by hierarchy level” feature is priceless. It’s also very fast to use. Freeplane [FREE] – a mind mapper, for when I need to separate out the thoughts a bit. Gingko App [FREEMIUM] – for arranging textual fragments on an infinite board, and organising them into a horizontal and vertical outline. TreeSheets [FREE] – an idiosyncratic software for brainstorming in table form (although it can also do mind maps). The Fullscreen view (F11) is simply fabulous! It shuts out all the noise and you can just concentrate on your table (I recommend colouring in the rows for easier analysis). VUE [FREE] – brainstorming in a flow-chart or concept map format with shapes and arrows. 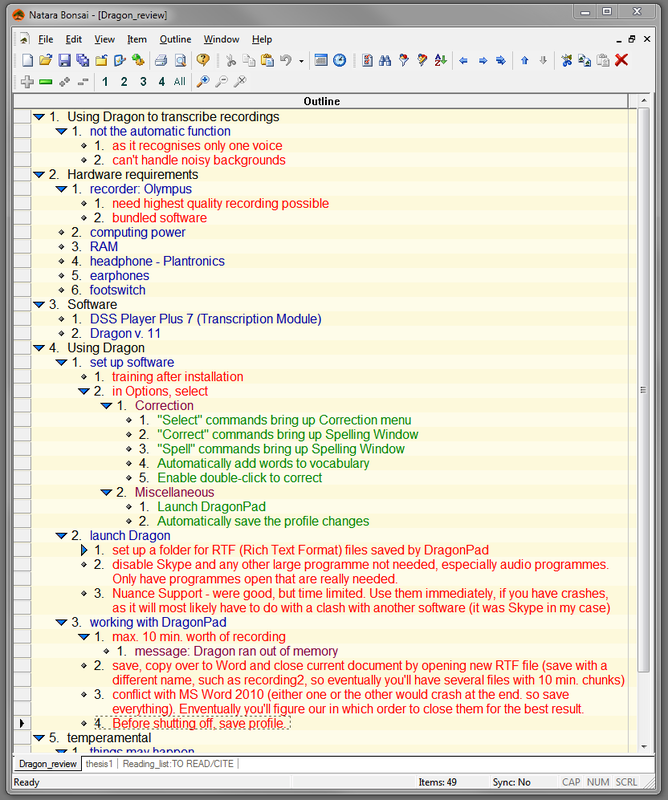 ConnectedText – there are at least four different ways of doing outlining in CT: 1) using the built-in Outliner tool, 2) using the Table of Contents pane, 3) using the ‘topics’ (documents) themselves as outline items (by either linking them to the Outliner or viewing them in the Navigator), and 4) in the body of a topic by turning on the “folding” option. Noteliner [FREE] – for quick outlining jobs. Natara Bonsai 5 Desktop Edition – for sophisticated large-scale outlining jobs (see my review of it here). Outline 4D (formerly StoryView 2.0) – for developing a final sentence outline and an initial draft and for reverse-outlining existing drafts. The main benefit of Outline 4D is that it allows inline notes (which Bonsai doesn’t). Freeplane [FREE] – an excellent mind mapping tool that works well with CT. It can import CT’s outline files with links to CT topics. It also works as a single-pane outliner with inline notes (plus the additional links to CT notes). Gingko App [FREEMIUM] – for simultaneous horizontal and vertical outlining. Boogie Board Sync 9.7 eWriter – outlining by hand. VUE [FREE] – for free-form conceptual mapping. Freeplane [FREE] – no nonsense mind mapper (I prefer it to its predecessor, FreeMind). One cool feature (in conjunction with CT) is that if you import a CT outline that contains internal links to CT topics (documents), Freeplane will preserve those links, so you can launch those links from Freeplane and it will open CT and bring up the given topic. SmartDraw CI (Enterprise Edition) – I use it to prepare graphics for presentational purposes (e.g. as figures in publications). It’s too convoluted to use as a tool for real-time thinking (even though it’s got a template for every imaginable activity from flow charts to Gantt charts); however, it does a reasonable job of turning existing content into visuals for wider consumption. WriteMonkey [FREE/DONATIONWARE] – a distraction-free writing application with Markdown support. My primary writing application. Gingko App [FREEMIUM] – a web-based outlining and writing tool (with Markdown support), using an index-card method and allowing for both horizontal and vertical outlining. Outline 4D (StoryView) – is my main drafting and reverse outlining tool. Scrivener for Windows – I use it mainly to gather the chapters of a large writing project (as a repository), as it can total up the chapter word counts. Dragon NaturallySpeaking Professional Individual – for actual writing by dictating (occasionally). Apple Wireless Keyboard – for typing. I have a PC and I have tried all kinds of ergonomic keyboards and nothing comes close to the Apple Wireless Keyboard. The amazing thing about it is that it is so small, yet the actual keyboard area is wider than any of my much bigger keyboards for the PC. Expert Mouse Optical Trackball – my ergonomic multi-button and multi-function mouse. PhraseExpander Professional – for inserting often used, long or difficult-to-spell words (or Markdown and ConnectedText markup expressions) as I write. Especially useful in combination with CT during the qualitative coding process, as you can save your list of codes as a separate glossary and use it effectively as a boilerplate. DesktopCoral + Samurize [FREE] – I combine these two utilities to display my research question as a single line of text in a narrow banner that stretches across the top of my screen, so that it is always visible, regardless whether any of my applications are maximised or in full-screen view. I make its background the same colour as WriteMonkey and Scrivener, so that it blends in to form a distraction-free environment. This is to remind myself at all times what should be my central focus as I’m writing in a variety of applications. Here is an example, although this solution didn’t have Samurize yet (the point of which is to also make the text visible in full-screen views without having to use WinSplit as a stop-gap measure). Text Inspection & Manipulation Utility [FREE] – for all kinds of textual transformations, from changing capitalisation to writing Twitter-length sentences. I don’t really have a favourite here. I use EndNote not because I particularly like it but because I’ve had it for a very long time and I don’t have a good enough reason to switch to something else. Having said that, I do like the fact that an EndNote reference’s raw code is fairly simple (as opposed to that of Zotero), so pasting it into a plain text draft (e.g. written in WriteMonkey) does not create too much disruption visually. I normally only convert raw EndNote code into formatted references in MS Word at the very end of the editing and typesetting process (as it is much faster to write in plain text than using the “cite-as-you-write” feature, which can become painfully slow and frustrating when dealing with very large Word documents). Direct Folders [FREE] – remembers to keep “open and save” dialog box size large (you can set desired size); keeps windows of other apps float over other windows (particularly useful when CT is maximised across two monitors). Everything [FREE] – super-fast file and folder locator. Allway Sync – for syncing folders across my PCs, notebooks and netbooks over LAN and wifi. Dropbox [FREE] – for syncing folders between my computers and devices. Fences – for organising icons into groups on my desktop. Double-clicking hides all icons to create distraction-free environment. WorkFlowy [FREE] – for cross-platform task management (Windows PC, ChromeOS & iOS). Replaced all my other to-do apps. Google Calendar [FREE] – I use it in a very non-GTD way by tracking my daily to-dos (work and personal) and recurring tasks on the desktop, the iPod Touch and iPad. Whatever I don’t get done, I reallocate into the future. I don’t dump all to-dos here, just the things that definitely need to get done. The key thing about this system is the audible and visual pop-up reminders, especially on the iPod Touch that is always with me. (I used to be a huge fan of DateBk6 on my Palm TX, however the screen was dying and iPod Touch crowded out my Palm in a number of ways.). Google Docs (Google Drive) [FREE] – I use Google Doc spreadsheets extensively to manage elements of my project, e.g. to track productivity. Classic Calendar [FREE] – a bare-bones desktop calendar application with text-only interface. The great thing about this app is its simplicity. Natara Bonsai 5 Desktop Edition – has a variety of task and project management tools in an outliner framework. Pimlical – for keeping an offline backup of my Google Calendar. Freedom – to block access to the no. 1 distraction on my PC (you guessed it: the Internet). Repeat Timer [FREE] – simple Pomodoro timer for the iPod Touch. three monitors – I find having three monitors essential for serious work with the software tools listed here. My left monitor (19in) is used for project and task management apps (calendar, to-do lists, productivity tracking), I do the writing in the vertically positioned (portrait mode) central monitor (22in) directly facing me, and I use the right monitor (22in) for reference (displaying data I need to refer to while writing in the main monitor). Winsplit Revolution [FREE] – is an excellent little utility for managing monitor real estate. It allows you to partition the screen (or both screens in my case) and have whatever is opened arranged side-by-side. a reasonably powerful PC – you will need plenty of processing power and RAM to run some of the software listed here. Dragon NaturallySpeaking is a massive resource hog, and Directory Opus also needs some juice to run smoothly. SE-TrayMenu [FREE] – application quick launch from the tray menu. Classic Shell [FREE] – so I can actually see what’s in my Windows Start Menu (Windows Classic style!). WizMouse [FREE] and KatMouse [FREE] – to scroll windows under the mouse (across three monitors) without having to click first. InoReader [FREE] – online RSS reader for reading blog feeds mostly (on my PC and on the iPad). Simple, effective, and fast. PureText 2.0 [FREE] – a single hot-key for removing rich formatting from copied text. Protopage [FREE] – is a personal web portal service which allows you to create your own customised home page (and many other tabbed pages) for your browser. This is the first thing that I see when I turn on the computer every morning. VistaSwitcher [FREE] – Alt-Tab replacement to switch between applications across three monitors. Stick A Note [FREE/DONATIONWARE] – a nifty little tool I use to stick notes to specific application windows to remind myself of keyboard shortcuts that are specific to those applications. But it also works as a general sticky note that can be attached to any specific file. TaskSpace [FREE] – a utility I use to organise ConnectedText’s floating windows (e.g. to move them together from one monitor to another) and to detach their behaviour from the main window, so they can be viewed independently, when the main CT window is minimised or hidden. If you have any questions about these tools or suggestions for better ones, please use the comments form below. I’ll be happy to expand on my existing tools or consider reviewing new ones. May Î suggest, Dtsearch, for indexing thousands of files (and search within pdf files with boolean operators!) and; Mendeley, to manage pdf articles. kalkito, thanks for the suggestion, I’ll look into dtSearch. I have tried Mendeley a while ago but I didn’t see a reason to switch from EndNote. What do you mean by managing PDFs? At the moment my PDF academic articles and books are linked to references within EndNote, while all other PDFs I eventually process and import their content or notes into ConnectedText, which is my central database. Great list. Will be a useful resource for anyone looking to find the right tools for their needs. Important tools for me (on my work PC) not mentioned on your list are (in order of importance) TheBrain, OneNote, Zoot and MyInfo. Thanks, Steve, also for the suggestions. I don’t see connectedtext as a caqdas. I’m using Atlas Ti for coding, dtsearch to search my huge collection of 200k academic books and articles, scrivener to write (love it) and ultrarecall/mindmanager to manage/generate ideas. Also I use timeleft and Jingle keyboard to boost writing speed. And a lot of metallica and megadeth. Don’t know Amode. Too expensive. Recently discovered Thebrain (well… finally got a pro licence c…) and noticed it uses dtsearch search engine. Still testing. Yes, maybe I should qualify my claim that “ConnectedText is CAQDAS.” It is certainly not marketed that way and it is not its primary purpose. However, what I would like to show on this blog is how CT can be used as a replacement for more expensive, dedicated CAQDAS software such as Atlas.ti and NVivo. It probably won’t work for everyone, however there are certain types of qualitative research processes for which CT in my opinion is better suited. Obviously I will have to expand on this, but that’s why I set up this blog. Regarding your comment about Amode being too expensive, it might be worth noting that if you are buying from outside Australia then you don’t have to pay their tax (GST), which makes it considerably cheaper. Thanks Andrew. I’ve been using Protopage for many years now. I have about 12 pages (tabs) in it with hundreds of links, RSS feeds, and embedded web pages. I have periodically checked out similar offerings from the big boys like iGoogle, myYahoo, Netvibes etc. but none of them offered as much flexibility as Protopage. Hi Gulnara – Thanks. I haven’t tried any of the options you have mentioned but I did have a similar problem. But first a question: do you really need to transcribe every single one of those handwritten notes? Or would it suffice to capture your comments (analysis and conclusions) about the notes? Here’s what I did. I had several A5-sized 200-page notebooks full of my handwritten notes. Solution 1: I scanned them all into PDFs, then annotated the PDFs using GoodReader in my iPad (but PDF-XChange Viewer is a free option on the PC), and then extracted the notes into a single PDF using A-PDF Comment Collector. But GoodReader can also extract the notes into text files, and there are some tools for that on the PC as well, if you look around. Then if you really need a section of the handwritten text, you can always just take a snapshot of the given passage in the PDF and insert the image file into whatever is your main database or CAQDAS. Solution 2: For longer passages that I definitely needed to transcribe, I just used Dragon NaturallySpeaking. But I also used it to capture my comments and summaries, when word-for-word transcription wasn’t necessary. I hope this helps. Good list, especially if one is a social scientist, like me. Compliments. As a bibliographical/work and research tool I highly recommend CITAVI. It has a student/teacher discount, works fabulous in its team version and is in all aspects (design, usage, features) superior to EndNote and Zotero. Thank you, Frank. I tried Citavi beta a couple of years ago and I was also very impressed with it. I didn’t switch to it in the end as in the meantime I discovered ConnectedText, which became my central database for reading notes, so I don’t really have a need for an intelligent reference manager any more. In the meantime I’m just trying to recoup my investment in EndNote, so I’m sticking with it, but I’d choose Citavi, if I didn’t already have EndNote. This is an amazing resource! Thank you so much for putting it together. I started using CT thanks to your website, and am deeply in love with it. Do you, by any chance, have any suggestions for photo management? I’m a historian and have countless files photos of my archival sources. Picasa, with its tagging feature, is serviceable, but far from ideal. Hello Ryan – thanks for your kind words. I don’t tend to deal with too many photos, so I haven’t had to deal with that problem. I also use Picasa. An alternative I came across that looks good is FastStone Image Viewer. Otherwise the preview pane and built in image viewer of Directory Opus serves me well. I just tend to drag and drop images into CT from there. Let me know if you find something better than Picasa, as I’m not crazy about it either. What a useful list. Thank you. However you might want to take a look at Amode, it seems to have completely disappeared from the Mindsystems website, the last reference I saw said that it had been ‘withdrawn’ temporarily whilst it was completely re-written to version 3. Usually software companies keep the previous version available until the new version comes out. Mind systems have done this before when they temporarily withdrew their Mindjet mind mapping program for a re-write, but when they re-introduced it, it was on a subscription license (you can’t buy the software, you rent it and it stops working when you stop paying the rent). Perhaps when and if Amode is re-introduced it will be on a subscription license, that would be bad news. Paul – thanks for the Compendium suggestion, I’ll have to try it out one of these days (though my needs are currently satisfied by VUE). Regarding Amode V2, my suggestion would be to contact them, they may have just accidentally broken the download links: http://mindsystems.com.au/knowledgebase.php?action=displayarticle&id=187. But I’m also happy to recommend RationalPlan as an alternative. Hi. Thank you for this list. It helps so much to learn of these types of things from one another. I’m sure it’s a best practice. A program you might like is Watership Planner (see http://www.watership-planner.com/documentation.html). I am simply stunned by this product’s functionality and impact on my personal effectiveness at goal, project, process, schedule, list, and task management. Even reading through the website is a wonderful education. Well, thanks again for this list! I see items to check out. Now I am zeroing on mobile apps with “desktop” webapps with collaboration, hashtag, and attachments features. Outlining is nice to have but not necessary since search by tags allows some “outline” view although not a real outline, just serial view of search results. I did not see you “favorited” the likes of Fetchnotes, Moodo, Twoodo, etc. They organize by tagging and allow freeform notes/texts. You prefer structuring your texts through outline understandably from your writing task requirement. Do you have any opinion on them? Thanks for bringing those services to my attention. Fetchnotes looks interesting, though I’m wondering if it is still being actively developed. Their last blog post is from April 2015 and they are saying they are joining another company. Otherwise I’m not wedded to the outline format. I’m quite open to other methods of organising notes (in fact outlines become a hindrance with large amounts of notes, hence I use a wiki for my main notes database). Pingback: A different approach to Note Taking | I used to be undecided, but now I'm not so sure. Could you please you tell me when you last updated this list? A long time ago… On 16 Sep 2012. I removed the “updated regularly” bit from the title, as I haven’t updated it for such a long time. Thanks for the reminder.